An object having special value because of its age, especially a domestic item or piece of furniture or handicraft esteemed for its artistry, beauty, or period of origin. An object in an unrestored state. Typically an older piece showing usage and wear. i.e. chips, cracks, holes, weathering, finish or paint wear etc. 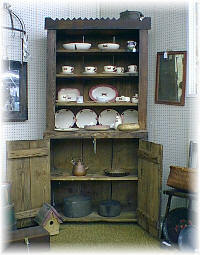 There are both antique primitives and reproduction primitives. 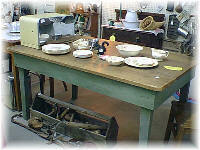 One of a group or class of objects, such as period glass, domestic utensils, coins, stamps or knives prized by fanciers.